Hey bartender, pour me another! Quite often, a great bartender can be the life of the party. 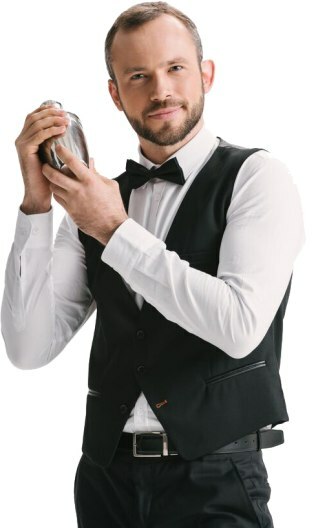 As long as they're shaking up delicious dirty martinis, classy cocktails, and cold beer, your guests will be loving the bartender all night. So don't let the drinks run dry! Hire a trained and knowledgeable bartender for your wedding reception, private party, or corporate event. Want to get crafty? Work with the bartender to create a few specialty drinks your guests will love. If you're looking for some extra excitement, book a flair bartender to entertain as they pour! Let the professionals handle the service, so you can enjoy the event! Search for Bartenders in Shawinigan, Quebec above. Please note that these Bartenders may also travel to Shawinigan, Grand-Mere, Saint-Gerard-des-Laurentides, Almaville, Shawinigan-Sud, Sainte-flore, Lac-mondor, Saint-Boniface-de-Shawinigan, Lac-A-la-Tortue, Notre-dame-du-mont-carmel, Mont-carmel, Grandes-Piles, Saint-Jean-des-Piles, Saint-Etienne-des-Gres, Herouxville, Saint-Maurice, Charette, Saint-Elie, Saint-barnabé-nord, St-Barnabe-Nord, Saint-Tite, Saint-paulin, Belleau, Sainte-Marthe-du-Cap, Saint-Louis-de-France, Renversy, Cap-de-la-madeleine, Sainte-Ursule, Saint-Prosper, and Proulxville.